You want to learn the guitar fast, but you don’t want the speed of your lessons to impede quality. That’s why we love this course; it helps you learn the instrument with a wide array of techniques, which makes retaining the material a whole lot easier. There’s almost everything you might want to learn, from scales and riffs to blues to musical ballads and guitar lics. You’ll learn to read music, play chords, read tablatures and perform full songs. The lessons come with a CD backed by a full band, and you can pan each track from speaker to speaker; pan right to hear more guitar, and pan all the way left to get rid of the guitar altogether, so you can play the song over the backing track! This exciting technique is appropriate for all ages, so no matter who you are, you can learn to play! This is the program for aspiring classical guitarists who want to become renowned; it’s likely that if a professional career in classical music appeals to you, you’ve already heard of the Royal Conservatory. The exams are notoriously difficult, requiring the musician to play with a high degree of technical accuracy and emotional depth; once you’ve gone through the programs, you may find yourself teaching music in no time. Our experienced teachers will ensure you are ready for each exam. This course is not for beginners; you need a firm grasp of guitar before enrolling. We’ll teach you in the space you’re most comfortable; your own home. This is great for parents of young children who don’t have time to travel to music lessons; your child will be more comfortable, and you’ll be able to hear them play unobtrusively. It’s great for adults, too, who find themselves at ease where they live. We’re strong proponents of at home learning! Music goes beyond language; it is experienced. It is raw emotion, brought to life by the player. Music can make us jump for joy, and it can bring tears to our eyes; sometimes both, in the same song. Music defines civilizations; when we go to a new country, or encounter a new culture, the first things we want to know are what kind of food they eat, what kind of buildings they build and what kind of music they play. Should extraterrestrials land on earth, they’ll probably have music if they have ears, and we’ll want to hear what instruments they love. Should they land in North America, they’ll probably hear a lot of guitar. Guitar might be the defining instrument for modern Western civilization, but it’s been around in some form for ages. What exactly defines a guitar depends on who you ask, but by the loosest of definitions, guitar-like instruments have been around for millenia. Some lutes (a type of stringed instrument) began to be called guitars in Spain by the year 1200; no matter how you slice it, guitars have been around for a long time. There are a myriad of different styles of guitar music, from traditional Spanish flamenco and Portuguese fado, to modern rock and jazz; each style of music has a different guitar associated with it, though they can all be transcribed easily from one guitar to another. Guitar can be broadly grouped into two categories, electric and acoustic. No matter what style of guitar you want to play, we have amazing instructors who will help you learn all the scales, chords, licks and riffs you could need. 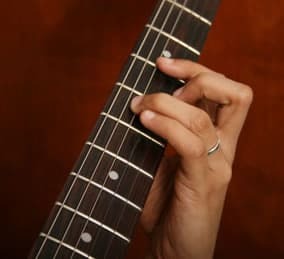 The ways you can play the guitar are incredibly varied, from finger picking to power chords; we’ll teach you any and every technique you might want to learn. All students are different. The guitar has had tremendous influence on almost all popular American music; starting with blues and country, to jazz, rock and pop, the guitar is ingrained in our collective conscious. What makes the instrument so appealing is the level of individuality that comes with it; each great guitarist has a style so unique, you can make them out the same way you can distinguish Robert Plant from Céline Dion. That versatility, the ability to make the guitar your own, is what continues to appeal to our love of self-conceptualization. That’s why everyone should learn how to play the guitar; it imparts upon you a sense of yourself you might not see otherwise. You’ll learn to develop fine motor skills, as you sense each one of your fingers playing upon the strings, up and down the fretboard. You’ll learn an incredible sense of timing, as your right hand moves in one motion and speed while the left moves in another. You’ll find yourself lost in the music that you’re making, and when you come out of the trance of playing you might not even know how much time you’ve spent. Guitar is transcendent, and you will transcend. Think of all the skills learning guitar can help your child develop. Certainly, it helps them learn creativity and widens their imagination outside of normal school. There’s no doubt it will increase their coordination, timing and musicality. They have to feel through a piece, as well as learn how to read notes and rhythms; they’re learning an entirely new language. This develops their emotional and rational minds, two things everyone in the world should always strive to develop. It will increase their confidence, and impart upon them that patience and discipline lead to mastery. Best of all, they’ll have fun doing it; there might not be a soul in this world who doesn’t enjoy music. Learning the guitar is for adults, too, and it comes with just as many incredible benefits. There’s even some benefits for adults kids might not see; you can learn to play those amazing riffs you used to (or still) love to headbang to. You can learn all of the classic songs, from Howlin’ Wolf to Hendrix and beyond, or you can learn gorgeous classical pieces that melt heart and old favorites that inspire singalongs. All this while increasing your confidence, creativity and hand coordination; it’s all upside when you’re learning the guitar. Of course, how you’re taught matters as much as what you’re learning, and who you’re being taught by is just as important. 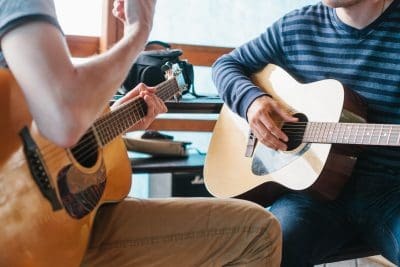 Our instructors are absolutely passionate about the guitar, and will help you learn a wide variety of different pieces and techniques. Whatever you’re into, they’ll be into too, because they genuinely love making and teaching music. The techniques we use are anything but dull; we’re using an innovative system that helps auditory and visual learners pick up the instrument.